Invisalign comes with a whole host of convenient features – they’re nearly invisible and completely removable, making it much easier to eat, drink, brush, and floss. But this convenience comes with a few minor drawbacks, particularly when traveling. Whereas traditional braces are always on so you don’t need to worry about them, Invisalign aligners can easily be forgotten or lost – so you need to be much more careful when traveling. 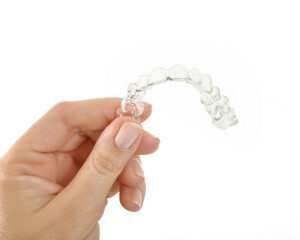 For this blog, we’ll tell you all you need to know about traveling with Invisalign. First of all, when traveling, it’s critically important to take great care of your teeth. Brushing and flossing become doubly important on the road, as if you develop any dental problems like decay or cavities, it’s much more difficult to get them looked at. Accordingly, be sure to brush your teeth religiously in the morning, before bed, and after every meal – this will prevent any problems from developing and keep your teeth safe and healthy. It’s also important to take good care of your aligners. Be sure to brush them every time you take them out and put them back in, as without regular cleaning they can accumulate food particles and bacteria that attack tooth enamel. In addition to brushing, we recommend soaking them in a glass of water with a denture tablet about once a day – and if you’re in an area where you wouldn’t drink the water, don’t use it to clean your aligners! Another thing to consider is when to change out aligners. If you’ll be gone for more than two weeks, you’ll need to take at least three sets along: your current set, your previous set, and your next set. If, when the time comes to change, you can easily put in and take out your aligners, you’re probably safe to move to your next pair. But if things still feel tight, don’t be afraid to stay with your current aligners or go back to your previous set. When traveling with Invisalign, always be sure to carry your aligners with you – either on your teeth or in your carry on bag. Flights can get delayed, bags can get lost, and you certainly wouldn’t want these inconveniences to impact your orthodontic treatment. One more thing to keep in mind – if you’ve finished your Invisalign treatment, you can actually use your last pair of aligners as a retainer! Have more questions about preparing for your big trip or your orthodontic treatment in general? We’re always happy to help. Feel free to call us at (416) 222-3223 reach out to us at our contact page with any questions or to schedule an appointment at our Toronto, ON office. We can’t wait to hear from you, and we’ll see you back at this blog for more tips and info on taking care of your teeth!